In the fifteen years I've spent in London, there are only a handful of restaurants that I have eaten in more than twice. Le Caprice is one that I have come back to time and again, and for good reason. This is not only a restaurant that has been around for as long as I can remember, it's also a restaurant that is truly adored by some pretty big names and personalities in town (and abroad). For me, however, Le Caprice is always held for very special occasions. Today, I found myself dining once again at the restaurant for a very special reason indeed as today was a celebration of two sophisticated brands, dedicated to superior taste, joining together for a special popup. 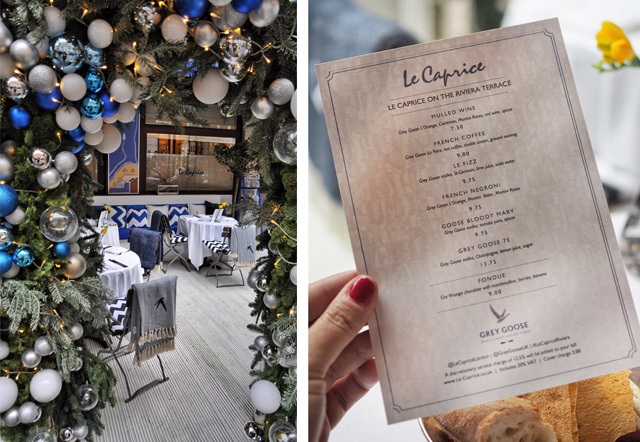 Grey Goose has recently opened a Riviera Terrace on the front porch of Le Caprice and the space is, quite simply put, a holiday haven. Surprisingly, I was the only one brave enough to step outside for more than a sip from the special cocktail menu. 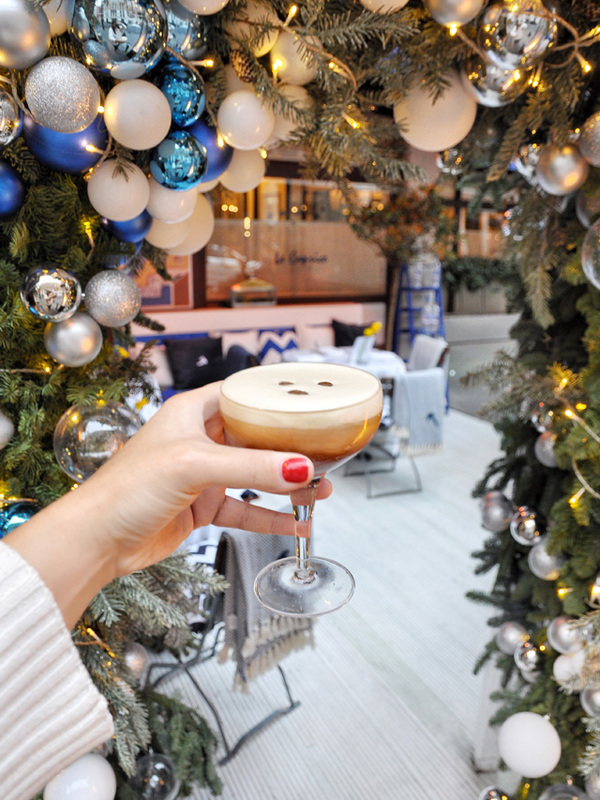 To be fair, I'm pretty sure the terrace itself was designed for those who wish to sip the special Grey Goose recipe mulled wine before their meal, or enjoy a Grey Goose L'Espresso Martini to finish. I indulged in both, with a full three course meal to boot. I mean you can't expect me to sit at Le Caprice and not partake in the menu, especially with a Grey Goose cocktail in hand. For those of you that aren't familiar yet with the importance of choosing Grey Goose as a spirit in your cocktail, you should know that this is a vodka that has been designed with culinary pairing in mind. 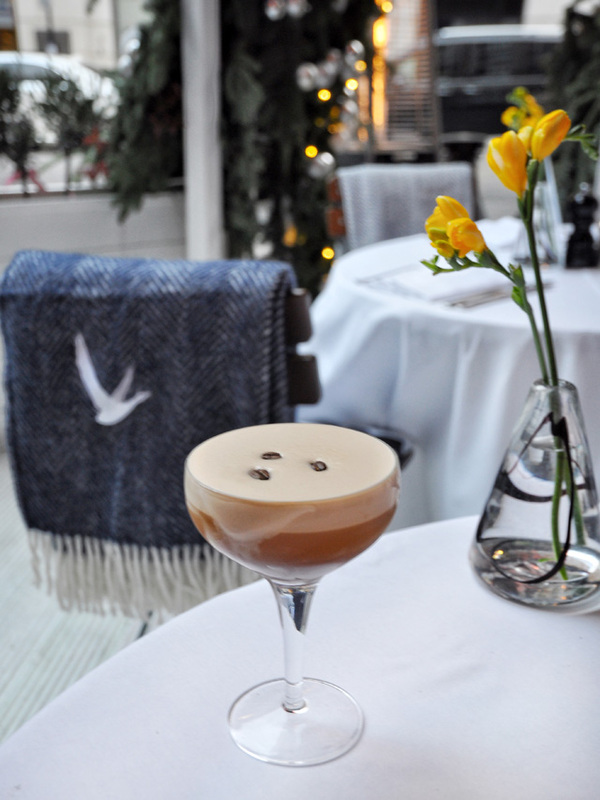 The geniuses at Grey Goose perfected the wheat vodka so that it would enhance not only the experience of the cocktail itself, but the pairing of cocktails with food, like pairing fine wine with a five course meal. 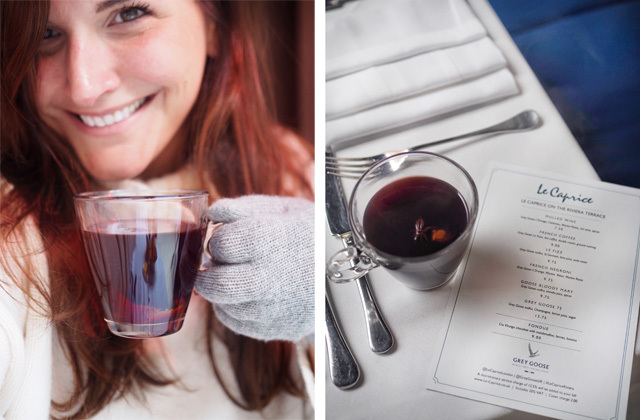 As I took my first sip of Grey Goose Mulled Wine, created with Grey Goose L'Orange, I still had my gloves on and coat across my lap. The lovely gentlemen at Le Caprice must have noticed my discomfort as it didn't take them more than 30 seconds to come out and turn on every heater. 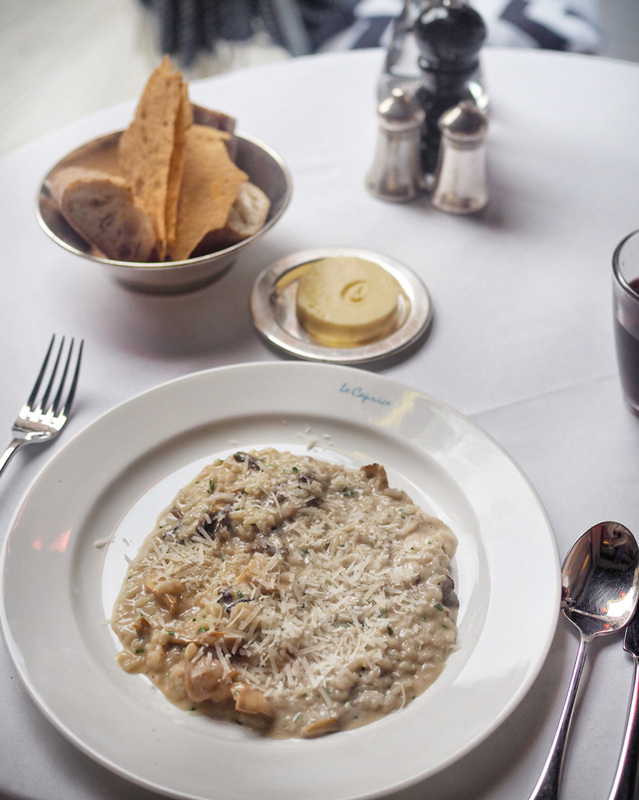 And let me just say that this is winter al fresco dining in London at its finest. There I sat, in the heart of St. James's, in the open air, in the dead of winter and I was as comfortable as if I were sitting inside. As each course was delivered, I seemed to thaw a bit more and was eventually seated with only a sweater on - all hats, gloves, coats and scarves having been shed. The Grey Goose Mulled Wine warmed me to the core, followed by a Le Caprice risotto special that only magnified the effect. 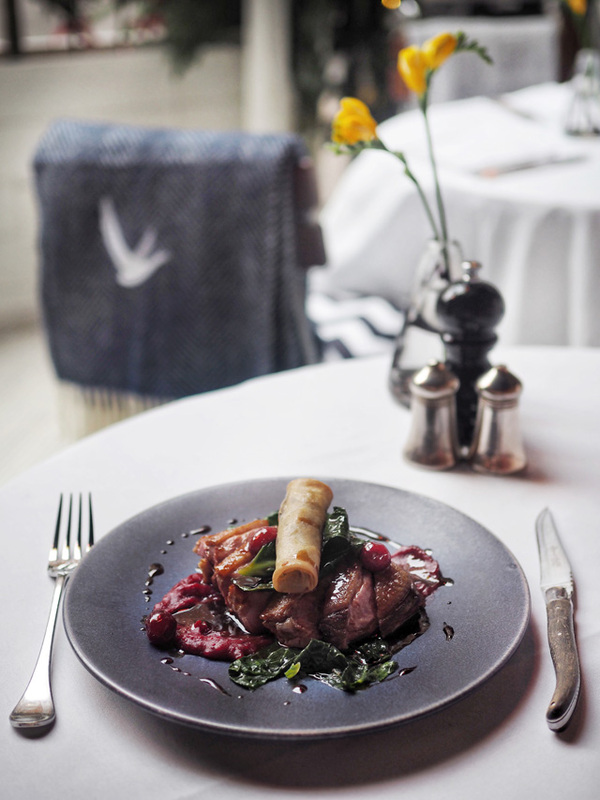 A main course of perfectly cooked succulent duck and I was reminded of why I hold this classic culinary haunt so dear to my heart. This is Christmas feasting at its finest, and in the open air. What could make this any better? Just you wait. I was preparing to wish my good servers ado, when the third course arrived. And this, you might want to prepare yourself for. 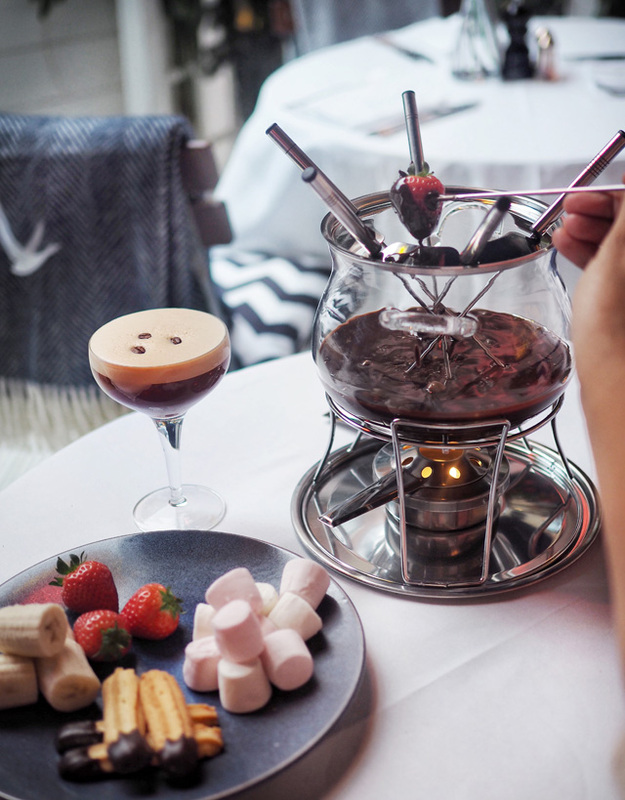 As part of the special Grey Goose menu on the Riviera Terrace at Le Caprice, one can order chocolate fondue and a Grey Goose L'Espresso Martini to finish their meal. This is luxury living on another level and a perfect pairing for a revival in the middle of the afternoon. In short, to be in London this winter and not partake in the Riviera Terrace is just plain silly. Whether popping over a for a cheeky cocktail, or sitting down to a three course meal, this is the perfect escape, and one we will most definitely need come the January blues. 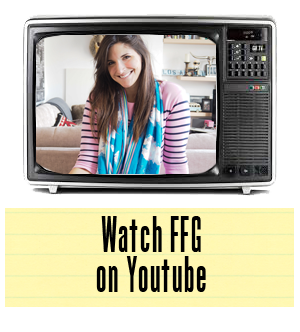 Put this on your radar now!